T o this point in my life, I have never really been a big computer person. I didn’t text until just recently. I don’t have a Twitter account, and I don’t spend much time on Facebook. To be honest, I don’t really spend a whole lot of time on the Internet in general. I’ve been known to give my opinion on racing — and quite a few other things as well — in a very direct, straight forward manner, and that’s what I plan to do here. 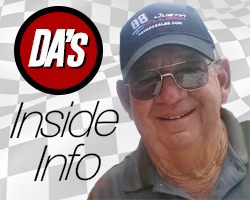 Starting with this blog, I’m going to talk about what I see on and off the track, in NASCAR and other racing circuits as well, and do so in the usual candid manner people have come to expect from me. So I hope you’ll check back often to see what I have to say. I hope you’ll find it informative and insightful. Most of all, I hope you’ll just enjoy reading what I’ve learned and have to share from a lifetime spent making left turns. 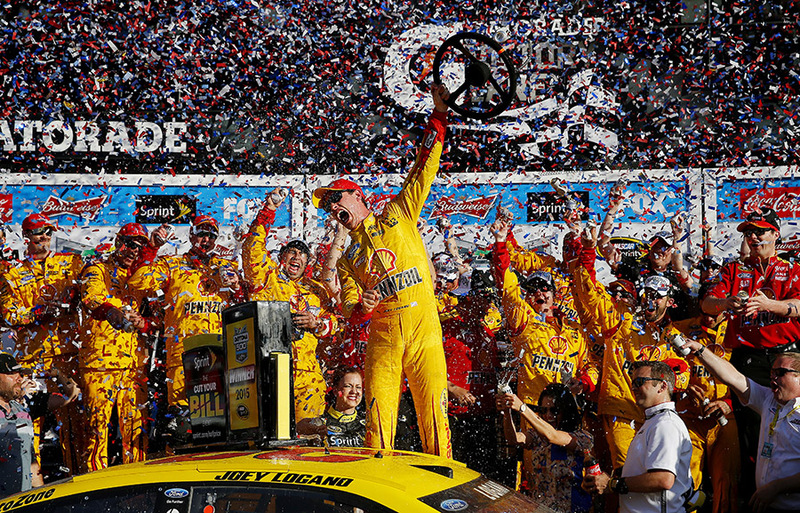 I can’t think of any better place to start than with Joey Logano winning his first Daytona 500 last Sunday. It was fantastic to see for Joey, his father, Tom, and their whole family. It was also tremendously rewarding for me because I watched him as a 12-year-old and saw at a very early age that he had what it would take to do something like that. The thing that makes me feel so good about it is they had what it took at an early age, they showed it and they backed it up. All I did was point out that they had what it took to do it, and they went on and did it. It’s amazing to see and very satisfying that I’ve had an opportunity to help those boys get started. I was a little nervous for Joey after Kevin Harvick got behind him at one point there in the race. 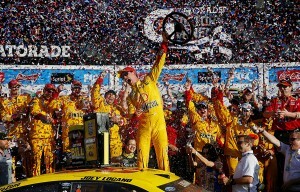 I thought back to the Sprint Unlimited the week before when they got together and had a little spat, and I thought “Oh no, is that going to come out in this race?” But Joey pulled away and by the end of the race I saw him do what is typical Joey Logano and that was figure out where he needed to be and how he needed to be running to win that race. Another driver who looked for a long time like he might win the race was Jeff Gordon, who was driving in what he says will be his last Great American Race. I’ve been torn since I heard him say this would be his last full season in Sprint Cup racing because, as competitive as he still is, I would hate to see him not race, but I understand where he’s coming from. I’ve heard him say two or three times he has a family and that’s good because a father only has a short amount of time to spend with a 6-year-old and then they’re not a 6-year-old anymore and so forth. I was very fortunate that when my daughter and sons were coming on, I did spend quite a bit of time with them. I was a coach for the boys in pee wee football and I hauled Pam back and forth to cheerleading and dancing recitals, and I was lucky to be able to do that. That kind of stuff is important, and this day and time, it’s harder than ever for the drivers to do. So for someone like Jeff who has accomplished everything he can accomplish in this sport to say he’s ready to leave to spend more time with his family, I think it’s the greatest thing in the world. I had a chance to help Jeff when he was getting started, too. I saw Ray Evernham just last week in Daytona, and he said to me “I haven’t forgotten the conversation about Darlington where you told Jeff that you didn’t care what he did, if he opened the throttle in three and four at Darlington, he better be able to get it open early.” I told Jeff that because somebody taught it to me, and I’m glad it helped him. Like most NASCAR fans, I’ll hate to see him go, but I understand it, and I just hope and pray that he has a very successful conclusion to a fine career. When that wreck happened, I knew it was going to be a bad one because I’ve been there, done that. In fact, I was talking to someone afterwards and I said, “You know what a driver says when you’re in that situation? A driver says ‘Oh s….’ this is going to hurt.” And it does because that wall is definitely hard. Right away everybody jumped on NASCAR about the soft walls, but I’m sure the reason NASCAR did not have soft walls there didn’t have anything to do with the cost or anything like that. I just bet that nobody figured a car was ever going to get there to run into that wall that hard. Daytona President Joie Chitwood said afterwards there will be soft walls everywhere now which is fine. That is kind of closing up the door after the horse is gone, but at least some good is going to come out of it that way. I could tell when Kyle hopped up on the window sill to get out, he told the safety crew that his leg was broken. I could tell from the way he was talking because, sadly enough, been there, done that, too. Hopefully Kyle gets well pretty quickly and doesn’t have to spend too much time rehabbing because he’s a fine racecar driver, and we are going to miss him. My final thought for this week is that the racing throughout the whole Daytona 500 was probably the best I’ve seen in the last 10 years. The drivers only got separated a little bit a couple of times, and they didn’t stay separated very long at all and they did a whole bunch of three-wide racing. It’s got to be the most nerve-wracking thing in the world to sit there in the middle of three wide, running 200 mph, not knowing which lane might move forward and which one might go backwards and hoping you’re not in the lane that’s about to go backwards. It was a great big chess game and when you moved the pawn, you had to be careful or you would get squashed. I really think NASCAR has the restrictor-plate package figured out pretty well now, and I don’t foresee them changing anything on it anytime soon. I mean how could they ask for anything better than what we saw last Sunday? That’s not saying something won’t come up down the road. With the intuition and the abilities the teams have they’ll figure out some way to make a change to their cars here or there to make them a little better and that’s not a case of bending the rules, that’s just interpreting the rules the way they need to interpret them. But as it stands now, from NASCAR’s standpoint I don’t know what they could do to make the show much better than the one we were treated to the other day, and I don’t think they need to try.